Judgment will start with us on the day of reckoning even though it seems we are more concerned on the judgment of the other nations first. The Most High respect no one more when it comes to those doing evil. The particular scripture James quotes is referring to gentiles of other nations which the Most High will call by his name who will serve Israel in the kingdom. Being that the Gentiles stood by faith there were few restrictions placed on them being they were in other countries and were not the people of the covenant. Certain things like circumcision were not mandatory for them and in the larger scale of things still didn’t benefit Israel anyway because their hearts were not circumcised. Lets look at what they were reading as it is written? Same thing that James said in Acts 15! The remnant are all the Edomites that are left after the destruction. They will be present too in the kingdom. Only then will the Most High begin to restore his people once we have secured the place of the gentiles will we serve no more. Christ stayed with the lady for some time and through that talk they had she was able to come to the knowledge that he was the Christ. Sir 24:1 Wisedome shall praise her selfe, and shall glory in the midst of her people. Sir 24:2 In the Congregation of the most high, shall she open her mouth, and triumph before his power. Sir 24:3 I came out of the mouth of the most High, and couered the earth as a cloud. Sir 24:4 I dwelt in high places, and my throne is in a cloudy pillar. Sir 24:5 I alone compassed the circuit of heauen, and walked in the bottome of the deepe. Sir 24:6 In the waues of the sea, and in all the earth, and in euery people, and nation, I got a possession. Sir 24:7 With all these I sought rest: and in whose inheritance shall I abide? Sir 24:8 So the creatour of all things gaue mee a commandement, and hee that made me, caused my tabernacle to rest: and said, Let thy dwelling be in Iacob, and thine inheritance in Israel. The children of the stock of Abraham was the children of Israel and the whosoever among you is the gentiles. Other nations were allowed to receive the gospel. 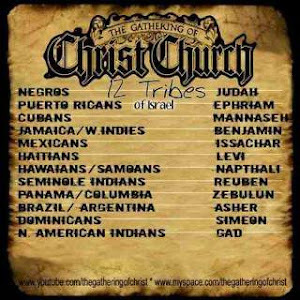 As we know the gentiles are those that are non Israelites. The context in the New Testament is imporant because you will not know when it is refering to Israelites that fell away or natural Gentiles. This is our purpose because we were sent to edify to these other nations to bring them unto the father. So this is showing us what we should be doing to bring forth the Most High's words but there is an order behind it first. So we are the Most High's servants whom he would use to bring forth his gospel to the other nations. So Christ is sent unto Israel who are turning away from the law of the Most High hence his purpose of being a redeemer. The Most High decreed for this to happen and so shall it happen. Jdt 14:5 But before you doe these things, call me Achior the Ammonite, that hee may see and know him that despised the house of Israel, and that sent him to vs as it were to his death. Jdt 14:6 Then they called Achior out of the house of Ozias, and when hee was come, and saw the head of Olofernes in a mans hand, in the assembly of the people, he fell downe on his face, and his spirit failed. Jdt 14:7 But when they had recouered him, hee fell at Iudeths feete, and reuerenced her, and said: Blessed art thou in all the tabernacle of Iuda, and in all nations, which hearing thy name shall be astonished. Jdt 14:8 Now therefore tell mee all the things that thou hast done in these dayes: Then Iudeth declared vnto him in the midst of the people, all that shee had done from the day that shee went foorth, vntill that houre she spake vnto them. Jdt 14:9 And when shee had left off speaking, the people shouted with a lowd voice, & made a ioyful noise in their citie. Jdt 14:10 And when Achior had seene all that the God of Israel had done, hee beleeued in God greatly, and circumcised the foreskinne of his flesh, and was ioyned vnto the house of Israel vnto this day. Gentiles will make it to the other side, we need to get out of this ignorant mindset. Other nations will have to call on the Most High also. but how are they going to know that if we do not tell them. I know that it may hurt and burn because you now have to teach the same people that have been killing and oppressing you, but it was not their fault it was our fault. So the Migh High is showing us even the sons of strangers, the sons of gentiles that join themselves to the Lord to serve him and love his name so they love AHAYAH! The Most High will accept their sacrifices in the day of Judgement if they are willing to put down their paganism. His house shall be a house of prayer for all people, not just Israelites. So outside of the Remnant of the Children of Israel that are gathered from the four corners of the earth. He is going to gather others to him too, they are the Gentiles that choose to accept Christ. This is where other nations will cleave unto to help us in the last days so it is not always about cursing people out all the time.